Details:	The 14 meter diameter silo is 37 meter in height and has a capacity of 1.2 million tonne. 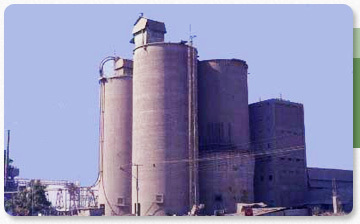 Challenge: The silo tilted by as much as 2 meter when cement was being loaded into it and cracked. It was resting on an adjoining silo, which made the job of repairing and realigning it extremely challenging. Solution:	The portion of the silo above the crack was supported by hydraulic jacks and by fitting steel brackets. Concrete jackets were provided to support the jacks and the upper portion. Concrete in the distress zone was cut in a controlled manner on the opposite side of the tilt. This was followed by lowering, i.e. tilting in the opposite direction, in small steps of 100 mm. The damaged portion was then concreted after bringing the silo back to its vertical alignment. 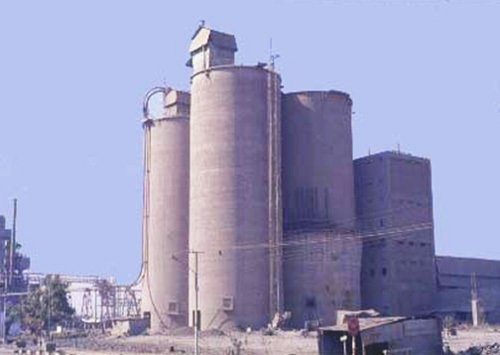 The outer jacket was integrated with the existing silo and a PSC ring beam was provided for increased effectiveness.